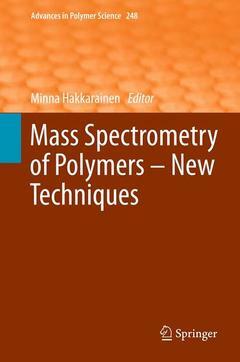 Emerging Mass Spectrometric Tools for Analysis of Polymers and Polymer Additives, by Nina Aminlashgari and Minna Hakkarainen. Analysis of Polymer Additives and Impurities by Liquid Chromatography/Mass Spectrometry and Capillary Electrophoresis/Mass Spectrometry, by Wolfgang Buchberger and Martin Stiftinger. Direct Insertion Probe Mass Spectrometry of Polymers, by Jale Hacaloglu Mass Spectrometric Characterization of Oligo- and Polysaccharides and Their Derivatives, by Petra Mischnick. Electrospray Ionization-Mass Spectrometry for Molecular Level Understanding of Polymer Degradation, by Minna Hakkarainen.